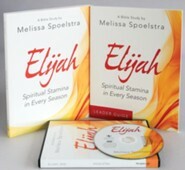 The Elijah Participant Workbook, to be used along with the study's DVD, includes five days of lessons for each week, combining study of Scripture with personal reflection, application, and prayer. Each lesson combines study of Scripture with personal reflection and application, ending with a suggestion for talking with God about what you've learned. Life is like a rollercoaster. One day it seems that everything in life is good, and the next day it can feel like everything is falling apart. Then there are those in between days when were coasting along without much thought to the highs or lows. The prophet Elijah experienced this rollercoaster ride as well. One moment he was hiding out in the wilderness during a famine, being fed by the ravens, and the next he was on the mountaintop where God showed up in a powerful way with fire and then rain. Even Elijah grew weary of all the ups and downs, telling God, "I have had enough" (1 Kings 19:4). 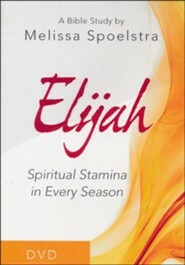 He needed spiritual stamina in order to keep on going and fulfill all the plans God had for his life. We do too! In this six-week study grounded in 1 and 2 Kings, we will examine the life of the prophet Elijah, an ordinary man who did extraordinary things for God in the midst of the highs and lows of life. Well learn some of the spiritual stamina secrets that helped him to hold on and persevere in faith, including practical habits related to making decisions, caring for the soul, accepting his circumstances, mentoring, and finishing wellwhich was his ultimate legacy. Whether were currently in a mountaintop season where were experiencing Gods power and blessing, a valley season where we feel like running away, or somewhere in between, Elijahs life will inspire us to go the distance in the life of faith. Best of all, his story will challenge us but not shame us, because well discover that Elijah was just as human as we are. He doubted and struggled just as we do, but ultimately, he chose to believe God. As we study his life, we will grow in faith and develop spiritual stamina that will help us not only to survive but actually thrive in every season. Other components for the Bible study, available separately, include a Leader Guide, DVD with six sessions of about 25 minutes each, and boxed Leader Kit (an all-inclusive box containing one copy of each of the Bible studys components). A companion Prayer Devotional is also available. 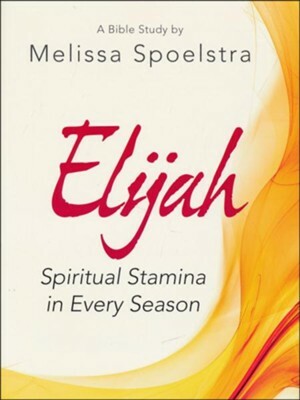 Melissa Spoelstra is a popular womens conference speaker (including the Aspire Womens Events), Bible teacher, and author who is madly in love with Jesus and passionate about helping others to seek Christ and know Him more intimately. She holds a Bachelor of Arts in Bible Theology and enjoys teaching Gods Word to diverse groups and churches within the body of Christ. She is the author of five Bible studies (Elijah, Numbers, First Corinthians, Joseph, and Jeremiah) and three books (Total Family Makeover, Total Christmas Makeover, and Dare to Hope). Melissa makes her home in Dublin, Ohio, with her pastor husband and four kids. 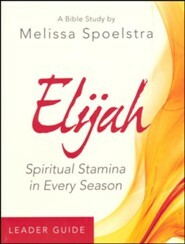 I'm the author/artist and I want to review Elijah: Spiritual Stamina in Every Season - Women's Bible Study, Participant Workbook.